I am awethentic to the degree to which I can know myself wholly in relation to the other, to the degree to which I can be myself wholly and be my wholly self, and to the degree to which I can wholly appreeshiate who and what I am, here and now, and why I am here in this world at this time. Awethentic appreeshiation is a process of making whole that which generates incongruence between inner and outer, or, if you prefer, between perceptions of inner and outer. Incongruence interferes with capacities to match and merge awareness with experience ~ and vice versa. With incongruence, what is “on the outside” (experience) is no longer a pleasant or accurate projection of what is “on the inside” (awareness) and what is “on the inside” (my awareness) is no longer a pleasant or accurate reflection of what is “on the outside” (the experience). On one level of consciousness, “inside and outside” is a carefully crafted space-time illusion designed for the emergence of catalysts for learning and growth. On another lower no less vital level, “inside and outside” feels very real to the subject in relation to the object in a world of subjects and objects. True, if my perceptions of subject and object were always in harmony, no learning would be necessary and no growing would be possible, and so, it is not the incongruence itself that is the problem, but how I choose to respond to said incongruence that could pose a problem, if indeed I care to respond at all. This same vital lesson applies to perceptions of interactions between subject (I) and subject (you or them). If I can make whole the relation or the interaction between perceived subject (I) and perceived object (that) or between perceived subject (I) and perceived subject (you or them) ~ consciously, creatively, constructively ~ then the “in” in incongruence can be graciously dropped. Interestingly, what is considered “pleasant” or “accurate” varies from subject to subject, depending on levels of skill and experience. What I personally find annoying or puzzling or troubling or disturbing, another might take more easily in stride, with little or no emotional charge. We are all subjects. That is to say, with awareness, we are all subject to experience, and with experience, we are all subject to awareness, and so, how we choose to mediate awareness and experience, to serve as mediator between experience and awareness, for ourselves and for others, goes a long way towards fostering the ideals of success and happiness, contentment and fulfillment, peace and prosperity. Being and becoming an effective, decisive, submissive, receptive, reflective, responsive, transmissive mediator of awareness and experience is itself a matter of choice, and so, it behooves the conscious and conscientious subject to gain some clarity on just what generates and perpetuates incongruence. This passage provides two insights: one, experience is vibrational or energetic in nature, coming and going, rising and falling, in and through awareness, and two, awareness is pure (full of love) to the extent to which experience and awareness can match and merge, or be matched and merged, without fear. In light of these two insights, one might be inclined to ask, as I am: is fear a friend or foe? The most honest answer that I can think of at this time is that fear can be a friend, fear can be a foe, and fear can be neither friend nor foe, depending on the event or situation that is coming into awareness. Fear can alert me to danger, in which case, I just might be able to step away or step aside; fear can push me or pull me away from a worthy or worthwhile cause, in which case, I can choose to stay the course through love; or fear can be telegraphed by another, sometimes in ways too subtle for me to notice. 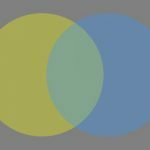 These practical distinctions point to a simple yet vital question for mixing, matching, and merging awareness and experience: connect or control? That is to say, do I connect or attempt to connect in love, with love? Or do I control or attempt to control out of fear? Connect or control? Subtle, fearful attempts to blame or shame through forceful righteousness or righteous forcefulness is the bane of contemporary discourse, whether said discourse is in the form of a discussion, presentation, or interaction. One might think that such attempts are endemic to third density consciousness, but it could be argued that such attempts point to a sickness in the souls of those who make them. Any such argument as this, however, would do well to be nuanced enough to take account of the role that legitimate personal boundaries play in keeping us, not only safe and secure, but also esteemed as persons in our own right, as respected, supported, and cared for. In the enforcement of a legitimate boundary, a forcefully righteous reception is healthy and justified, but in the encroachment of a legitimate boundary, a righteously forceful intrusion is anything but healthy and justified; it is a sickness, a bane of humanity through the ages. Having said this, I do appreeshiate that everyday interaction is not always as clear cut as this, as so many among us have an elephantine capacity for recalling and remembering insults and injuries with great sensitivity, no matter how slight and no matter how inadvertent. 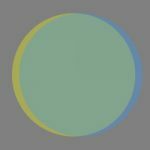 Yellow and blue make green: the meaning of this statement will soon become apparent in this post. I would now like to draw attention to a common distinction ~ conscious or not conscious? ~ and do so with an uncommon intention: to tap and taste their positive and negative potentials. 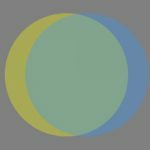 I picture a circle that is solid yellow in color, representing my awareness of being conscious, of being consciously creative and constructive with my energy and my effort, so as to realize my relevance as a person of significance in this world at this time. 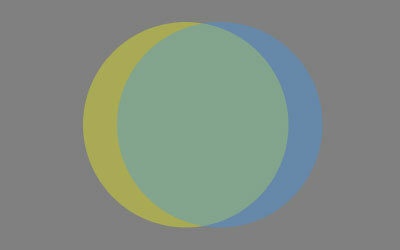 I now imagine a circle that is solid blue in color, next to (but not yet touching) the yellow circle. 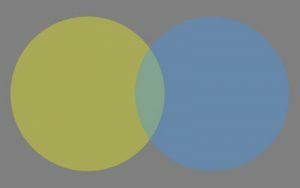 This solid blue circle represents my experience of not being conscious of my potential to be creative and constructive, as perceived through urges and impulses to be reactive or destructive with what I perceive as opposing or threatening my relevance as a subject of significance in this world at this time. I tend to view and treat these dark urges and impulses as catalysts for growth in my daily experience of life ~ catalysts that serve, at least potentially, to expand my awareness of that which would have me be more submissively capable of receiving it and more transmissively capable of responding to it. In not being conscious, I do not know what I cannot know, and so I am faced with the task of being humble enough to address two versions of arrogance, along with their respective shadows of ignorance. Arrogance 1.0 goes something like this: what I know about life and this world is all there is to know. As you can well imagine, this delusional disposition casts a very long and dark shadow of ignorance, sometimes for an entire lifetime. Arrogance 2.0 is not much better, and goes like this: of that which I am certain is how things are (or were). At least this delusional attitude is amenable to correction. so as to avoid feeling fearful, anxious, uncertain, or doubtful more often than not? what if bodily sensation and emotion are taken as gateways to awareness? 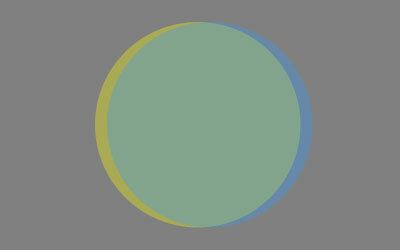 I can now see these two circles of influence ~ one conscious, one not conscious ~ as touching. 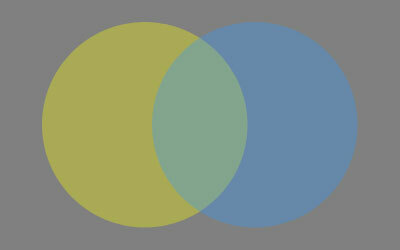 The yellow circle of influence that has me long for personal, interpersonal, transpersonal significance mixes and merges, if only slightly, with the blue circle of influence that has me yearn for personal, interpersonal, transpersonal expression, producing a green mandorla of influence that is capable of having me receive, reflect, and respond to an ongoing awethentic appreeshiation of significant expression or expressive significance, with a generosity of spirit, through heart and soul. One could ask, with a constancy of ecstasy in mind: to what extent can I delight in my own mandorlas, where miracles arise? That is, how deeply might I take delight in them, and furthermore, how intensely, how frequently, and for how long might I endure these delights? In being wholly conscious with awethentic appreeshiation, dare I ask myself this twofold question: what is my deepest, most cherished wish, and what is holding me back from fulfilling it here and now, and not just here and now, but over and over and over and over again, ad infinitum?